Businesses require reliable, cost-effective, durable, and affordable conveyor belts to keep production lines moving. Hoffmeyer is proud to supply economical PVC conveyor belts to multiple industries; including food processing, manufacturing, and chemical supply companies. 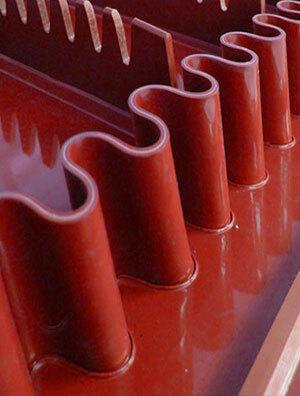 Hoffmeyer PVC belts can withstand stretching, ozone, and a wide range of temperatures. PVC conveyor belting is made with low-stretch polyester and woven into a durable carcass, creating a belt that is flexible and highly resistant to chemicals and oils. PVC belting’s wide range of properties makes it the ideal economical belt, as it is extremely versatile. We offer PVC conveyor belts in a variety of strengths, colors, compounds, and cover styles to meet your business’s exact requirements. Hoffmeyer supplies PVC belts that are covered with FDA/USDA approved materials to ensure your food processing application is in compliance with governmental laws and regulations. If your processing plant utilizes conveyor belts to move materials that contain fatty and oily substances, appropriate belting must be implemented to prevent costly repairs due to belt degradation. Hoffmeyer supplies PVC belting with a friction surface and brush backs on the bottom side for slider bed applications. Non-skid friction belts are also available with top and bottom coatings for easy package handling and conveying materials up an incline. The experts at Hoffmeyer will help you determine the specific type of PVC belt necessary for your business’s application. At Hoffmeyer, we are dedicated to providing you with experienced customer service. Our staff is extremely knowledgeable and well versed in providing custom conveyor belting solutions. Contact a Hoffmeyer representative today to discuss your needs, and we will find the exact PVC conveyor belt to meet your business's needs. Hoffmeyer is an industry leader and is dedicated to surpassing your expectations. We provide a full line of PVC conveyor belts and PVC belting solutions to meet your company’s material-handling needs. Contact us today!